Is it possible to make 588RWHP on 20psi from a GT35/40 BB turbo with 1.06 hot side? Or is the dyno not working properly? I run a 98ron fuel with 10% Ethanol and water injection. Large extended porting 550 primarys 1680 secondarys. 2 x walbro pumps. Im not at home right now but I will post up the dyno graph later on when I get home. Yea must be the dyno. Had some twin turbo FDs on there that i tuned with all the bolt ons and both put out 250kw wich is 335hp. Is that about right for TT on 15psi? the twins sound close but the 35r sounds high to me but you never know. Took me 22psi on a 4094 to make 504! do you guys have restrictions on your exhaust systems? Do you still have to run a cat of some sort and the airpump? I have no cat at all and no airpump. Just wondering. Will post my dyno graph soon. I dont know what the dip in the graph is, perhaps the ignition or something. 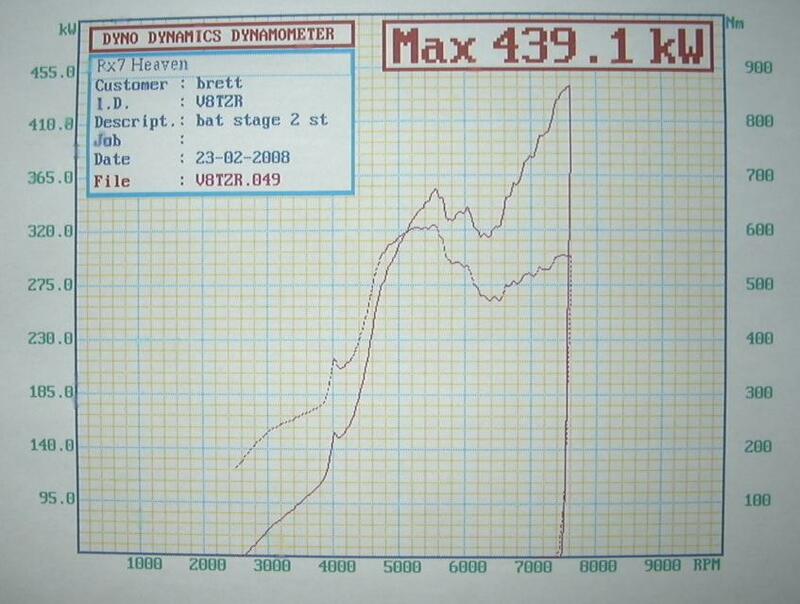 We were runing 7 and 9 plugs with water injection but they soon died on the track the day after the dyno tune. I have some HKS race plugs now. I will see if I can get it back on the dyno and see if the new plugs make a difference. Yea I know. It was the last run of the day on stock plugs, they were on the way out. We did not have any colder plugs to use that day so we decided to see how the water injection would cope. I have another sheet with all the graphs on and that is the only 1 that seems to dip. That shet seems weird. 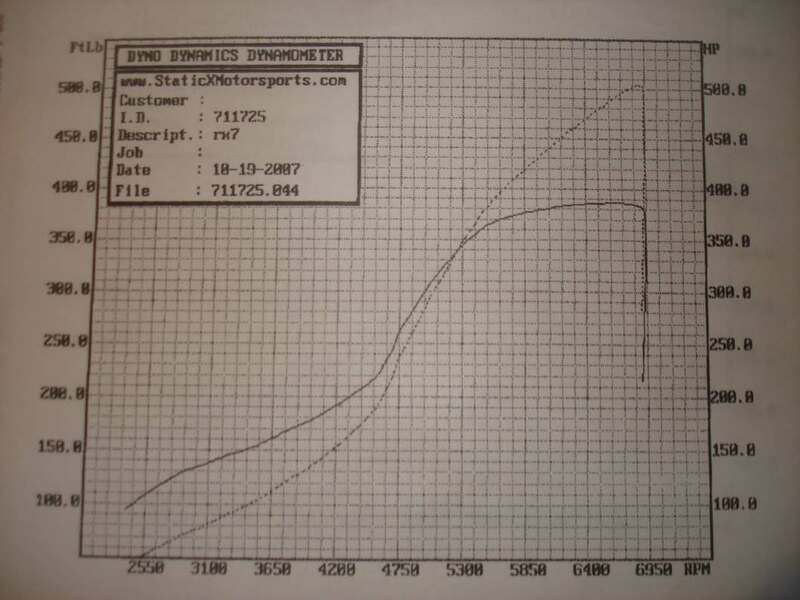 Here is mine on the same dyno "dyno dynamics" just for comparision. You could always just go trap it in the 1/4 mile and we could pin point your rwhp. Send through your other sheets, that sheet is aweful. could be wheel spin, or the dyno not coping with what you are doing. ie over speed. Your torque should be a nice flat line with horsepower rising in quite a linear fashion once the turbo is on full boost. Power figures seem way way too high for that size turbo.